Hilton Head Island - We currently have 8 Hilton Head Island vacation homes, condos and villas listed on this page! Going out to eat is one of the greatest joys of being on vacation. Most Americans are thoroughly familiar with all the places to eat in their home town and surrounding areas, but vacations provide an opportunity to try places that are completely new. In Hilton Head, tourists will find a delightful array of French restaurants offering the finest continental and French cuisine. One example is Alfred's Restaurant, located south of the Palmetto Dunes on the William Hilton Parkway, also known as Highway 278. Open exclusively for dinner service, Alfred's specializes in combining facets of continental and American cuisine. The menu offers temptations based on seafood and meat, as well as soup, salads, and appetizers both hot and cold. The wine list is equally impressive, with selections from France as well as Italy, Australia, and California. A rather unusual feature of Alfred's is that the chef's counter overlooks an open kitchen, meaning that diners can watch the preparation of their meals. Reservations are recommended. Another excellent choice for French cuisine is the Caf St. Tropez, located in South Island Square. This restaurant serves both lunch and dinner and is owned by two chefs who were both trained in Europe. Chef Emmanuel has experience working in restaurants rated with one and two stars in the Michelin guide, but has operated this caf close to the beach for 12 years. The specialties here consist of food selections from Provence. Visitors who eat at either one of these restaurants will afterwards be ready for a long sleep in the comfortable beds at their Hilton Head vacation rentals. 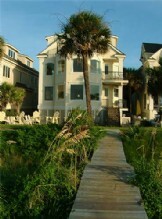 Looking for vacation rentals near to Hilton Head Island ? Below you will find writings from other Hilton Head Island vacation rental owners about the area they know best! It's a great way to learn first hand about the Hilton Head Island region and all that it has to offer! Hilton Head Island is world renowned as a world-class resort community and has been named one of the top 10 family-friendly beaches in the country, by numerious publications. A barrier island that is approximately 12 miles long and 5 miles wide, Hilton Head Island features 12 miles of pristine white beaches and some of the finest golf courses in the country. There are also hundreds of tennis courts, two tide free harbours and a wonderful eco tourism amenities. Hilton Head Island, South Carolina is a vacationers paradise with nearly 12-miles of pristine beaches, plenty of family activities, world-class tennis and golf, and of course, shopping and dining to die for. As one of the largest destinations on the east coast, Hilton Head has quickly become famous as one of the hottest family vacation spots. This affordable destination invites families year after year to enjoy the beaches, and tremendous family activities. Everything is within walking distance to plenty of shopping and restaurants. Not to mention miniature golf, bike rentals, tennis courts, bike paths, etc. Most famous for golf, the area has nearly 40 golf courses. The famous Harbour Town Golf Links hosts the Verizon Heritage Golf Tourney each year and attracts pros and amateurs. Whether you are a family, golfers, going on a tennis retreat, romantic weekend, girl’s weekend, or business meeting, Hilton Head has all that you need to make your trip memorable. Hilton Head Island is located on the Atlantic Ocean,20 miles North of Savannah,Georgia and about 80 miles south of Charleston, South Carolina. It is a popular vacation spot for people from all over the world. It is a very convenient 4 hour drive from Atlanta. This island is 45 minutes North of Savannah, GA and 45 minutes South of Beaufort, SC and is a barrier island once known for its cotton, indigo and rice plantations. It is now known for it's beach, golf, tennis and shopping with new restaurants opening all the time. A bit of four seasons with the charm of the south, the seafood is fresh, the beaches are famous and so is the golf. There are no neon lights or billboards. Restaurants number around 250 including entertainment and the arts all abound with a touch of class. Located off the coast of the South East corner of South Carolina, Hilton Head Island is connected to the mainland by a series of low undulating bridges. Famous for fabulous golf courses and 12 miles of white, sandy, pristine beaches and all the pleasures that make for a family vacation, Hilton Head is lesser known but is more importantly a natures treasure chest. From bald eagles nesting in massive live oak trees, to bottle nose dolphins chasing schools of fish up onto the marsh banks, to the amazing sea turtles who return yearly to lay hundreds of precious eggs in the sand dunes Hilton Head Island is a fascinating vacation location.